A contrarian viewpoint on film, television, and popular culture. Though I have been a fan of superhero comics since youth, I’ve never been one to defend them, as others have been overeager to, as being anything high brow or of great redeeming cultural value. There’s a really good reason for that; though I’ve certainly read comic books and graphic novels which have shown amazing narrative form, surprising intelligence, exceptional creativity, and brilliant illustrations, there’s something that the vast majority share in common that often precludes them from making that further step toward becoming high art and/or high literature. It isn’t one of the common flaws you would think typical of comic book media, such as the ridiculous costumes, implausible names, and exaggerated physiques (all worthy points of criticism and exclusion, to be sure). For me, simply put, it’s the violence. Comic book worlds are wrought with overly trivialized acts of sometimes random, indiscriminate, and even appalling violence. Few, if any, problems in these universes are ever solved through nonviolent means, and those same problems are almost always initially caused by violent transgressions. With that said, violence is an unavoidable and consistent part of our mass entertainment, and when done with proper tone and restraint it can be cathartic and fun in spite of its relative moral dubiousness. However, far too often in modern comic media over the last twenty or so years, and especially so in the last decade, the violence depicted in American mainstream superhero comics has crossed a real fine line, often becoming morbid, unrelenting, unpleasant, and ultimately unredeeming. For me, Marvel Comics’ Ultimatum represents the textbook example of how violence in mainstream comics may have finally gone so far beyond its tipping point that there may be no return. 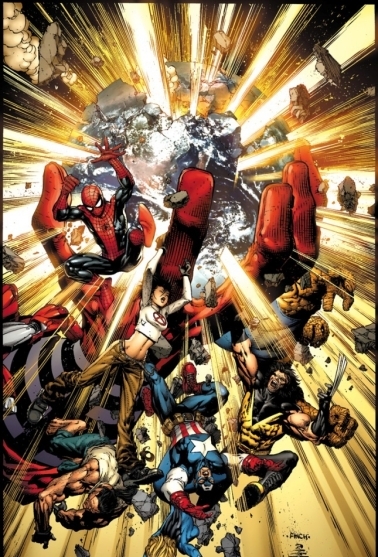 The wrap-around composed of the five covers of Marvel Comics's Ultimatum, consisting of almost all the members of Marvel's Ultimate universe. A limited series published over five issues between late 2008 and summer 2009, Ultimatum was presented as the major climactic culmination of Marvel’s “Ultimate” line of comics. For those unfamiliar with the particularities of comic book publishing, the Ultimate imprint, which once included the continuous series Ultimate Spider-Man, Ultimate X-Men, Ultimate Fantastic Four and additional limited series such as the three Ultimates series (the Ultimates being the imprint’s version of the popular Avengers), was launched in 2000 and its continuity exists independently of the mainstream Marvel Universe. Faced with a reading audience whose average age was skewing far older than ever before, and with both initial X-Men and Spider-man films being released within a few years of each other, Marvel crafted the Ultimate imprint as a way of drawing a new, younger generation into becoming comic book fans. Unencumbered by the mainstream universe’s very dense (and in some cases, borderline impregnable) continuities, the Ultimate imprint reintroduced many of the famous superheroes and supervillains of the Marvel universe and recast their origins in a more contemporary and relevant setting. Beginning with Spider-Man, and then continuing with the X-Men, Fantastic Four, and so on, the Ultimate line was, in essence, an isolated rebooting of the Marvel universe and its iconic characters presented for a new, younger, hipper generation. The beginnings of Marvel's Ultimate imprint: Ultimate Spider-Man #1 (2000). Though many older “purists” never embraced the concept and certain aspects of the presentation faced criticism, the idea was initially very successful, both commercially and creatively. The art and writing were mostly consistent, and sometimes, surprisingly sophisticated. After a few years, though, the concept began to sputter a bit, as some attempts to modernize characters were far more successful than others and the line began to grow relatively stagnant. Before long, the Ultimate imprint appeared to lose interest in trying to present their characters to a new generation of readers and instead fell into the same isoteric traps that had plagued the mainstream continuity. The writing itself felt more concerned with appealing to the stalwart fans than attracting new eyes. New approaches to old characters, instead of being fresh interpretations for a new generation, seemed to be more concerned with intriguing (or annoying) longtime fans with their new variations of old characters and storylines than standing on their own. A possible reason for this was that many many writers and artists who worked on the Ultimate line also worked on the mainstream continuity, and as a result the two separate universes began to feel too similar in tone. The Ultimate version of the classic Spider-Man villain Green Goblin remains one of the imprint's more polarizing reinterpretations. Existing independently of the canonical burden placed on the main continuity, the Ultimate line in recent years became more focused on marketing itself as a continuity where “anything can happen;” major characters could, and would, die, and the seemingly biblical rules that held the mainstream in check could be changed at a moment’s notice. In the very beginning of the run, this was actually a good thing, as one of the core strengths of the Ultimate universe was its relative verisimilitude. While characters in the mainstream universe aged gradually, if at all, in the Ultimate universe they aged with more consistency and in better correlation with reality (the Ultimate Iron Man/Tony Stark, for instance, has cancer and thus only has a set amount of time left to live). And then there was the violence: the Ultimate universe, like the mainstream one, was incredibly violent, but the violence was again treated more realistically than in its mainstream counterpart. In addition to being substantially more graphic, catastrophic damage did not repair itself overnight, and many of the series were very frank about the collateral damage in human lives that battles between superhuman demigods could cost. For a case in point, when the Ultimate incarnation of Bruce Banner changed in the middle of downtown Manhattan into his incalculably strong and perpetually enraged counterpart the Hulk, civilians died by the hundreds. Nothing here was sugar-coated, which in the beginning was a refreshing approach and gave the various series an increased gravitas and a more somber poignancy. 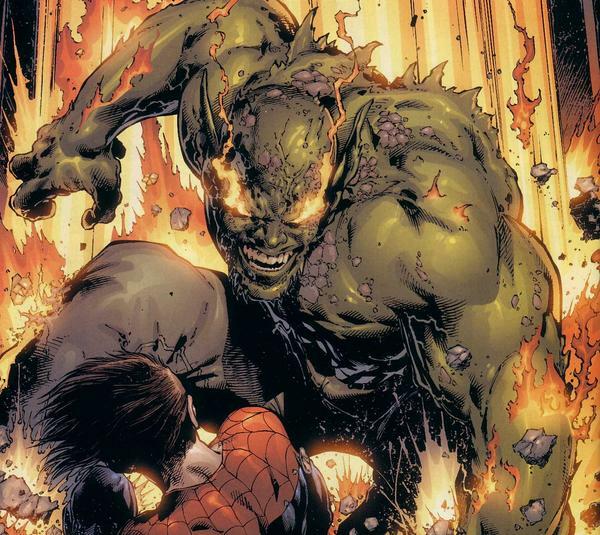 The Ultimate Hulk dispenses with his nemesis the Abomination in a graphic fashion typical of the Ultimate imprint. However, the Ultimate line inevitably became symptomatic of the “crisis/event” trend that has emerged as a constant in mainstream comics over the last decade, and really since September 11. The conflicts of good and evil in both the Marvel and DC comics universes have, more and more, been played out on an epic scale, with battles involving hundreds of characters and the threat of complete extinction being a constant, overused danger to each of the many universes. Near-apocalypses are nothing new to comic books (superheroes “save the world” as a natural course), but since September 11, manifestations of the death-obsession and teases of the end times have become too numerous to mention. As someone who was tangentially involved in September 11 and has studied post-millenial anxiety, I have personally found comics’ continued representations of the end times to be quite fatiguing, and it has often made catching up on mainstream comic books feel more like a chore than a diversion. It was inevitable that the overarching doomsday fetish in mainstream comics would eventually coincide with the escalating violence particular to the Ultimate universe. And the result of this was Ultimatum. Advertising art for Ultimatum, specifically marketing it, and celebrating it, as an apocalyptic narrative. The story of Ultimatum is not especially complex; after the death of his two children, the superheroes Quicksilver and the Scarlet Witch, the mutant supervillain Magneto goes insane and, abandoning his ideological desire for mutant supremacy, attempts to annihilate all human life on Earth. Using his magnetic powers to flip the Earth’s magnetic poles and push the planet off its axis, Magneto spawns countless number natural disasters around the globe and within moments murders millions of people, including a fair number of superheroes and supervillains. Faced with the horrific loss of life, Professor X, leader of the X-Men, uses his telepathy to alert the few remaining superheroes of Magneto’s guilt, before himself being murdered in cold blood by his old nemesis. The remaining story focuses on the heroes essentially regrouping, counting their losses, and quelling some various disastrous conflicts before going directly to Magneto’s home base for a final showdown with the Master of Magnetism. 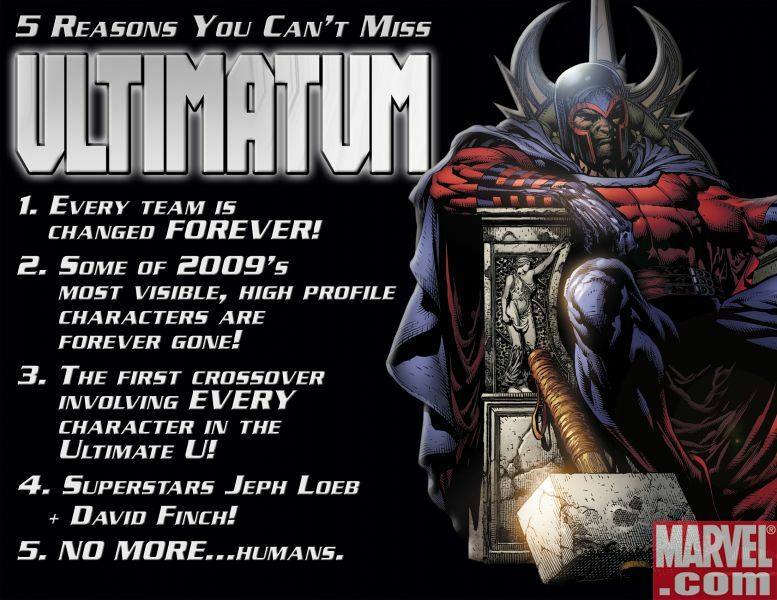 An advertisement listing the selling points for Ultimatum, with 2. implicitly advertising the morbid idea that many favorite superheroes were going to die, and 5. teasing the narrative's depiction of complete human genocide. In many respects, Ultimatum reads very much like the comic book equivalent of a snuff film. Dozens of heroes and villains are killed during the course of the story, and in ways that appear horrifically brutal. Dismemberment, incineration, decapitation, drowning, and worse are continuously depicted as happening to characters that have, for years, engendered an emotional attachment to the reader, and some of the most famous characters in Marvel’s history are not excluded from the death toll (including those with their own movie franchises). Even New York City becomes struck down by a tsunami, killing hundreds of thousands of people, and that’s only in the first few pages! Nothing seems beyond the pale here, including suicide bombers and cannibalism. 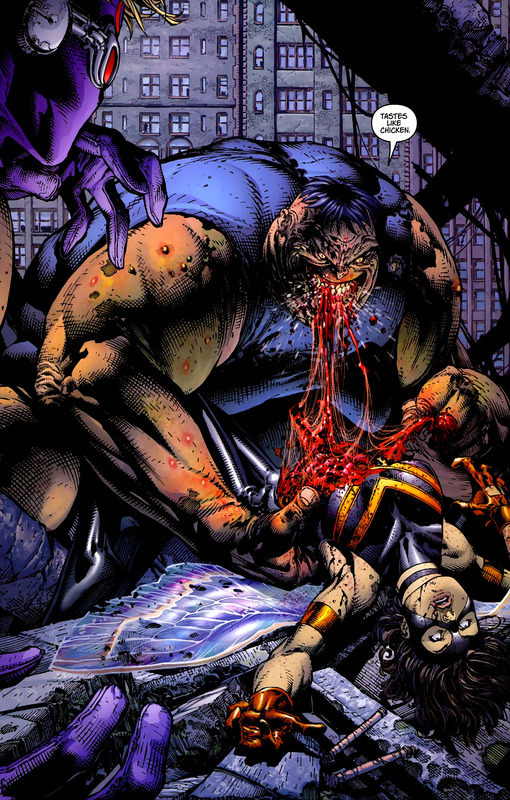 The superheroine Wasp being devoured by the villain Blob in one of Ultimatum's more horrific images. What’s worse is that the many of the heroes become the perpetrators of some of these violent actions, especially at the climax of the story. And that really gets to the heart of all of the carnage on display in Ultimatum: there’s nothing ultimately (no pun intended) redemptive about any of it. This is just a depiction of nihilistic pain and destruction, seemingly with the only real purpose to show that it could be done. 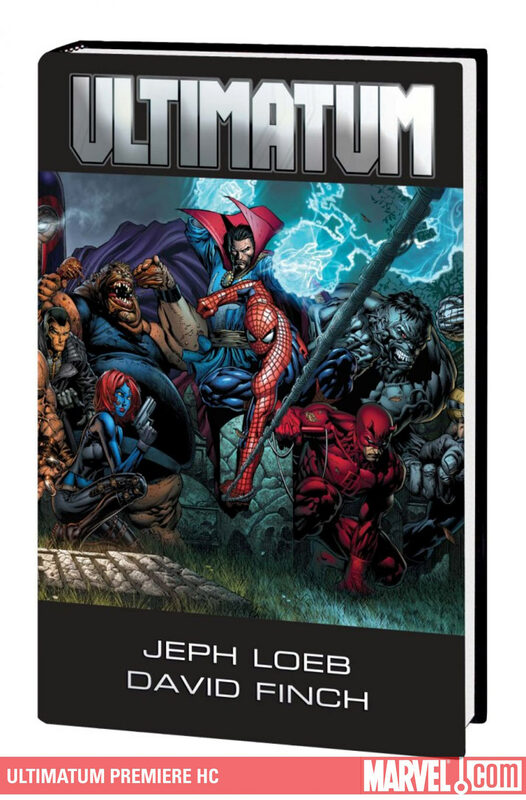 Though written by the acclaimed Jeph Loeb (who had not written for the Ultimate universe prior to this), this feels more like a tawdry, vulgarized fan fiction written by an extremely embittered and sadistic fan then a work of a top grade publishing house. But instead, this was a major comics publisher’s attempt to appeal to its fanbase by advertising the kind of violence that it could not normally get away with. But this is not entertainment, even by post-millenial standards; it’s a fetish for catastrophe, designed to appeal to a limited amount of fans of horrific violence and gore. For an imprint that was designed to broaden comic book readership, one wonders who this was really supposed to appeal to. 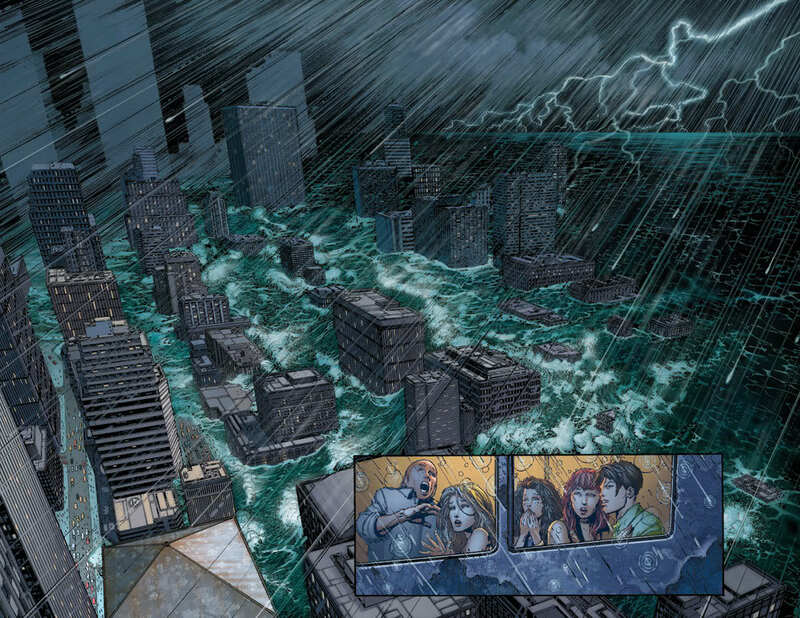 An incredibly disturbing image from the first few pages of Ultimatum, depicting New York City being destroyed by a tsunami. To be fair to comic book fans and critics, Ultimatum was near universally panned and rejected upon its completion. 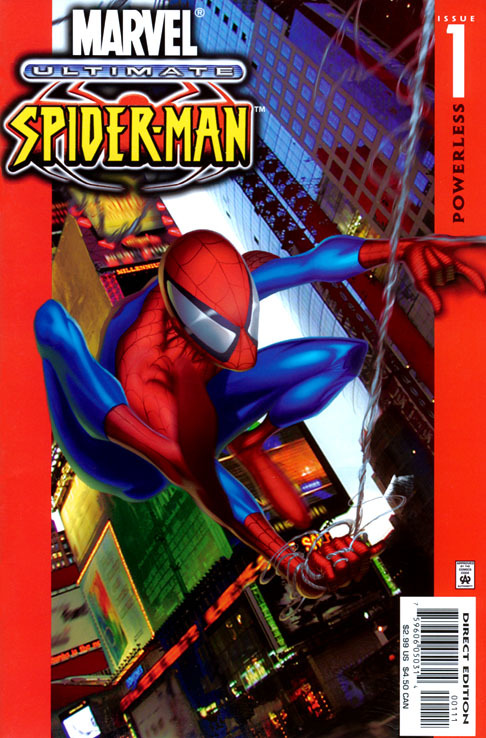 According to IVc2, while the first issue was the best-selling comic released that month (at about 115,000 copies sold), the second issue sold about 20,000 less than the debut (which contained the depicted destruction of New York City), and the final issue was about 10,000 less than that one, meaning that it ultimately lost about a quarter of its audience over its duration. In the aftermath of Ultimatum, the Ultimate imprint was rechristened and streamlined as Ultimate Comics, and this month will be relaunched (yet) again. Reading something like Ultimatum personally made me feel somewhat sad about what superhero comics have turned into. Once upon a time, they were compelling, action-themed soap operas with moralistic cores and engaging characters both good and evil. After the late 1980s and the work of Frank Miller, Alan Moore, and others, they grew more sophisticated and introspective (and violent), but they still understood their basic core appeal. Now, however, they seem more concerned with appropriating the pain and anxiety of our times and using it as fodder for violent spectacles that have abandoned almost all allegorical purpose. Nothing really embodies this more for me than Ultimatum: with its entire appeal designed toward literally tearing down its own heroic world in a violent spectacle of blood and apocalyptic disaster. While as I said, I’ve never considered them high brow or high art, I’ve always considered superhero comics to be quality escapism. But in the end, something like Ultimatum isn’t escapism; it’s something to escape from. Batman: The Dark Knight’s Best and Worst – Live Action Edition! Jon Morris is a failed screen and script writer, failed academic, and soon expecting to be a failed novelist. However, he's also an avid cineaste, a student of philosophy, a devotee of the humanities, a keen political observer, a semi-voracious bibliophile, a history buff, a literate fanboy, and an eloquent writer and scholar. Naturally, all of this makes him completely unemployable in this economy. He has a Bachelor of Fine Arts from the University of Southern California in Screenwriting and a Master of Arts in Cinema Studies from NYU Tisch School of the Arts.